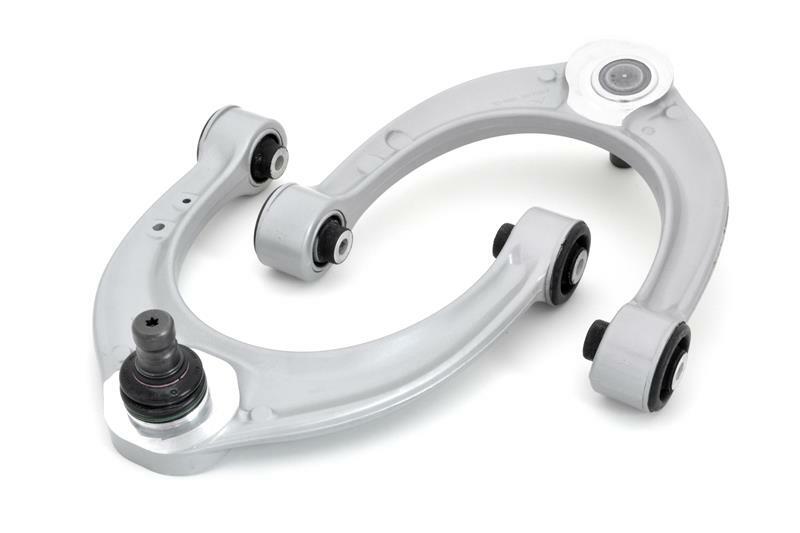 Negative Camber Control Arms provide a remarkable reduction of understeer and more immediate turn-in from the M6 by inducing more negative camber on the front wheels. The additional negative camber improves the grip of the front tires in the turns thus reducing the vehicle’s tendency to “plow” or “push” the front end for those who drive a bit more aggressively. This increase in negative camber is accomplished in two ways. The shorter front upper control arm increases camber gain, which is the amount of negative camber that is created by the geometry of the suspension as the car rolls to one side. In addition the static negative camber or the amount you will see on your alignment read out is also increased. The combination of static and dynamic camber gain adds an increase in front grip when the tire is loaded. A quick look at your front tires will tell the story. If you are noticing significant outside edge front tire wear, perhaps even a bit of ‘’cupping’’, you are definitely a candidate for the Negative Camber Control Arms. Not only will the extra camber improve the M6’s handling, but you’ll also likely notice more even tire wear, assuming you continue to corner aggressively.